← The Giant’s Shoulders #27 is out! Have I mentioned how much I love Henry Kuttner’s writing? I’ve reviewed quite a few of his books here — Elak of Atlantis, Thunder Jim Wade, The Time Axis, Destination Infinity — and have greatly enjoyed all of them. Kuttner (1915-1958) was a versatile writer of the pulp era who could easily jump between styles. He wrote fantasy, horror, science fiction and adventure stories and managed to compose classics in each genre, though some of his greatest work was written in collaboration with his wife, C.L. Moore. His science fiction is what he is most remembered for, and the stories are a joy to read, often employing mathematical and scientific concepts in clever, even poetic ways. Though I’ve been sidetracked by other things of late, I’ve been eager to read all of his novels. So what can I say about ‘Well? I actually had a hard time getting through the first few chapters, because I found it initially somewhat erratic and unsatisfying, but it picks up significant speed about halfway through (it’s only 125 pages) and I enjoyed it much from then on. It isn’t quite the same caliber as The Time Axis or Destination: Infinity, but it is still an enjoyable book. The novel starts oddly enough — government agent Clifford Sawyer has traveled to a remote uranium mine to investigate reports of ghosts haunting its lower levels. He first meets with Klai Ford, a lovely young woman with a mysterious past (she doesn’t remember her own past) who is co-owner of the mine. From her, he learns that the other co-owner, a shady old man named Alper, has communed with the spirits in the mine and may have set his sights on having Klai eliminated. Sawyer meets next with Alper, and events quickly spiral out of control. Alper tricks Sawyer and manages to bring him under his power, but events in the mine thrust Alper, Sawyer and Klai into the extra-dimensional world from which the ghosts originate. Once there, they find a ruling class of immortal and invincible godlike beings, the Isier, who cruelly rule over a society of humans known as the Khom. Also involved are a sub-human but also invincible race of being called the Sseli, who are the sworn enemies of the Isier, and the mysterious Firebirds, the ghosts of the mines, whose connection to the others is not quite clear. Nevertheless, Alper, Sawyer and Klai find themselves in the middle of a power struggle between the Isier, and they end up in a cycle of temporary alliances and unexpected betrayals that lead inevitably to the secret of the Isier and the possible destruction of their world. As I noted, the story initially lost me — the characters are quite superficial, especially compared to Kuttner’s other sci-fi works, and the early events such as Alper’s seizing control over Sawyer seemed rather contrived. Even the first descriptions of the extra-dimensional world felt kind of uninspired! As always, however, Kuttner eventually justified the faith I’ve had in him. The early events set up a wonderful power struggle between the various characters, human and Isier alike, and the twists and turns of the story used the seeming contrivances in very clever ways. The world itself fleshes itself out quite nicely once the primary villianess, the Isier Nethe, really starts her own machinations, and it is intriguing to imagine wicked beings who are genuinely impervious to harm and the implications of this. Kuttner again draws his inspiration from a scientific idea; in this story, he works with nuclear physics and radioactive decay. The Isier are described crudely as “isotopes” of humanity; this idea sounds somewhat silly at first but Kuttner manages to develop an entire world and history around it. I couldn’t put the book down while I was reading the final chapters. 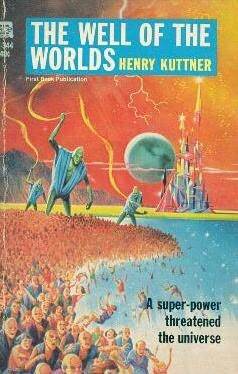 Though I don’t consider it quite as good as Kuttner’s earlier science fiction, it is still an enjoyable novel with thought-provoking ideas.